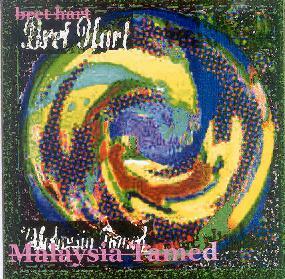 Bret Hart - "Malaysia Tamed"
Bret Hart continues to dig into the archives from his O-Right label and reissues goodies from years gone by. Malaysia Tamed is a set of guitar explorations from 1989, recorded while Bret was stationed in Korea with Uncle Sam. The disc is full of Bret's experiments with layered guitar parts, usually combining conventional and avant-garde stylings and sounds to create really interesting one man ensemble pieces. Among the highlights is "The People's Republic Of Massachusetts", which consists of Blues rock done up Hart style, with freaked out layers of guitars, combining standard Blues styles with acidic, Beefheartized solos. "Pneumatic Creole" is a similar acid Blues rocker. "J.J.Whale" features a more traditional take on the Blues, interpreted á la "Whale". "Godot Won't Show (So Go)" is one of my favorites, being a slow, drugged tune with dark whining guitar licks, cool spacey efx and an eerily stoned psychedelic atmosphere. This sounds a lot like what Mike Wingate (The AcidGuitarKing) does these days. Still rockin' but in more avant-garde territory is "Uncoiling", which has a bit of a Fred Frith styled edge to the guitar. "Shave an' uh Haircut" and "Unembellished" are similar and include the kinds of free-improv sounds that characterize much of Bret's music that I've heard. Along with the more aggressive stuff we also get serenity on songs like "She Glides, He Spies" and "The Ties That Bind", both pleasant melodic pieces with a cool combination of guitar parts. Bret excels at creating something beautiful that's still way out in left field. And dig that winding drone that accompanies what sounds like could be the melody to a James Taylor song on "(Korean-) American Beauty". The wailing soundscape guitar line that follows the acoustic guitar on "New AquaVelva" produces a similar effect. Overall, a fun and inventive set of guitar improvs.